It looks like a jellyfish, it swims like a jellyfish, but is it really a jellyfish? This fascinating creature, created by scientists at Caltech and Harvard with rat cells, has been called the “Medusoid” and is able to mimic the movements of a jellyfish due to muscle cells from rat hearts. 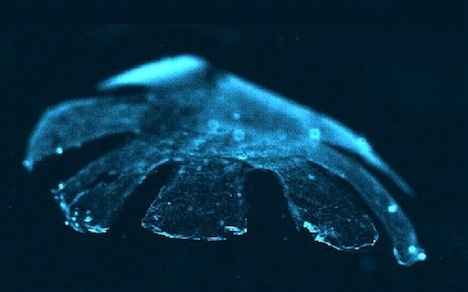 The cells were implanted into the silicon frame and grew into the pattern of actual jellyfish muscles. The scientists sent an electric current through a container of liquid, which “shocked” the muscles into contracting and allowed the artificial jellyfish to move through the water. This development is huge, proving that reverse engineering in muscular organs and simple life forms is possible, even suggesting that what we consider to be “synthetic life” can be valuable in replacing the building blocks of life in the event they become damaged. Co-author Kevin Kit Parker, an authority on cell and tissue-powered actuators, has done previous demonstrations showing bioengineered constructs can pump, grip, and walk. His frustration with the state of the cardiac field was the inspiration behind his idea to mimic a jellyfish. Jellyfish pump their bodies through the water, similarly to how a human heart moves blood through the body. Building this design to mimic the functions of a jellyfish gives new insight to how pumps like this actually work. This design strategy will also apply to reverse-engineering muscular organs in humans, and the study authors hope to advance the mobility of the jellyfish by getting it to turn in certain directions and respond to environmental changes. Do you think this has the potential to help along significant advances in medical technology?